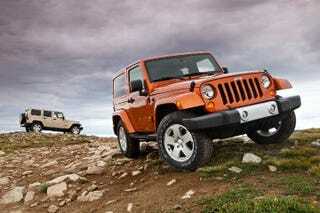 The 2011 Jeep Wrangler and Wrangler Unlimited are here and include a much requested body-color removable hard top and a not-quite-as-highly-requested upgraded interior. Otherwise, it's still a Jeep Wrangler. What do you want? Oh. Pictures? Sure. Many, many pictures below. The new removable body-color hard top (fun to say) is a standard feature on the Sahara premium model. Ignore the irony that is naming a trim level with the most standard features after a barren place and enjoy the new USB interface for MP3/USB music playback or the Bluetooth audio. The best feature, though, may be the 110-volt AC outlet, which is something someone using a Jeep like a Jeep might want. No word on pricing or delivery dates, but Chrylser does say it's already in production. And lest you forget, they've even stamped "Jeep, Since 1941" into the passenger grab handle. More info in the full press release here.